La révolution du 25 Janvier 2011 en Egypte vue par quatre jeunes réalisateurs talentueux. Ils choisissent trois différentes approches : "Le Bon, la brute et le truand." When Egyptians woke up on January 25th, 2011, they never expected the one day demonstration planned for that public holiday to evolve into a full out revolution aimed at overthrowing the regime's 30 year long grip on power. Four talented young directors decided to tell their story of the revolution from their unique cinematic point of view, choosing to focus not only on the politics, but on a handful of individuals whose actions would determine their fate and forever change the future of their country. This is the story of their revolution told from their eyes with three different approaches "The Good, the Bad, and the Ugly." Tamer Ezzat - Cairo, March 21, 2011 "I'm so intrigued by the transformation of those Egyptians. Only a few days before January 25, they were generally apathetic and submissive, but within a matter of days, they were united for a common goal and they became warriors." Ayten Amin - Cairo, March 21, 2011 "In the middle of Tahrir Square, a space was allocated for the construction of a monument in remembrance of the victims and martyrs of the Egyptian revolution. I wonder if it will say "these martyrs were killed by the bullets of Egyptians in police uniform?" Amr Salama - Cairo, March 21, 2011 "It was a journey of exploration into the mind of a dictator, raising questions and seeking answers about what made him a dictator and how we can prevent ourselves from creating a new one." Months after Hosni Mubarak stepped down, Egyptians country-wide seem determined to maintain the insurgency until their demands are met. It is therefore too premature to expect filmmakers to imagine fictions that convey the unimaginable experience of the uprising. A different predicament hangs over documentary cinema, and Tahrir 2011 is a laudable attempt to steer away from reportage and reflect on what historians will index as the first chapter of the uprising. Structured in three chapters, the film playfully debunks misconceptions and stereotypes. 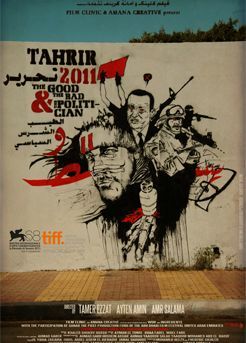 The Good, directed by Tamer Ezzat, gives voice to the everyday heroes from Tahrir Square. We encounter a group whose political, cultural and regional affiliations could not be more different, but who each embody the spirit of the millions who camped in Tahrir during the eighteen-day siege. The Bad, directed by Ayten Amin, films a rare account from four internal security officers assigned to crush the uprising. As they explain their role on the other side of the figurative trenches, their testimonials give chilling insight into the mindset and strategy of Mubarak's security apparatus when it came to silencing dissent. The Politician, directed by Amr Salama, offers a satirical take on "how to become a dictator in ten steps," and a smart deconstruction of Mubarak's persona over his thirty-year rule. Salama interviews figures who have observed Mubarak closely, whether as trusted associates or outspoken opponents, such as Mohamed El Baradei, renowned contender for the presidency. Also engaging are discussions with columnist/satirist Belal Fadl and internationally acclaimed novelist Alaa Al Aswany. In this special Mavericks presentation, the screening will be followed by a conversation with two of the Cairo-based filmmakers, who will offer their personal reflections on the changes taking place in their country. Tamer Ezzat studied at the American University in Cairo. He directed the documentaries Makan Esmo el Watan (2006), The Place I Call Home (2008) and the feature The Ring Road (2010). Tahrir 2011 (segment, 2011) is his latest film. Ayten Amin was a second assistant director on the films Zay el naharda (2008) and Basra (08). She directed the short film Spring 89 (2009). Tahrir 2011 (segment, 2011) is her latest film. Amr Salama was born in Riyadh, Saudi Arabia. He is a writer, director, editor and actor. He directed the films Zay El Naharda (2008) and Tahrir 2011 (segment, 2011). La mattina del 25 gennaio 2011 gli egiziani non potevano immaginare che quel giorno di festa nazionale si sarebbe tramutato in una rivoluzione per l'abbattimento del regime. Grazie ai social media, la nuova generazione araba ed egiziana aveva potuto assistere alle atrocità commesse dal regime del presidente Hosny Mubarak negli ultimi trent'anni. Per 18 giorni il mondo ha visto il popolo egiziano scendere in strada per porre fine all'ingiustizia, alla povertà e alla corruzione. A questa nuova generazione appartengono anche tre registi che hanno voluto raccontare la storia da un punto di vista cinematografico unico. Tamer Ezzat, con la collaborazione di Ahmed Abdalla, mette in primo piano il coraggio di diversi personaggi, le cui azioni hanno spinto alla rivoluzione la gente attorno a loro. Ayten Amin racconta il suo viaggio personale tra la polizia e le forze dell'ordine, che mai aveva affrontato prima della rivoluzione. Emergono così la corruzione e l'ingiustizia delle forze di polizia soggette al regime di Mubarak. Amr Salama scava nella mente e nell'anima dell'ex presidente Hosny Mubarak, intervistando importanti personalità e politici che sono stati alleati o oppositori del regime. Questa è la storia della rivoluzione vista attraverso i loro occhi in tre capitoli diversi, dal titolo: Il Buono, Il Cattivo e Il Politico. Tamer Ezzat - Il Cairo, 21 marzo 2011: "La trasformazione degli egiziani mi ha colpito moltissimo. Soltanto qualche giorno prima del 25 gennaio erano un popolo apatico e sottomesso, ma nel giro di poche ore si sono uniti per il bene comune, diventando dei veri guerrieri". Ayten Amin - Il Cairo, 21 marzo 2011: "Nel cuore di Piazza Tahrir sorgerà un monumento in ricordo delle vittime e dei martiri della rivoluzione egiziana. Mi piacerebbe sapere se recherà l'iscrizione'Questi martiri sono stati uccisi dai proiettili dei poliziotti egiziani'". Amr Salama - Il Cairo, 21 marzo 2011: "È stato un viaggio attraverso la mente di un dittatore, che ha sollevato domande e risposte su cosa lo abbia reso tale e come possiamo salvaguardarci dal crearne un altro".